MUSCATINE – Police warned Kristy Reiser about traffic in front of her house on 2nd Street in Muscatine: “They told me that it would be closed from 2 p.m. until 6 p.m. That’s it.” That was Tuesday, and Reiser probably didn’t mind. After all, it’s not everyday that the vice president of the People’s Republic of China comes to your neighbohood. The next day, Reiser seemed clearly amused, because the view from her porch looked like a bad day outside the United Nations, only with heckling from Tea Party members added to the mix. China’s vice president and the likely next president Xi Jinping (pronounced: she-jin-ping) was in town after spending Valentine’s Day in Washington, D.C.. in lengthy discussions with President Barack Obama about economic and military relationships with China. Xi, with a delegation of government officials and business leaders met with Gov. Terry Branstad and then had a reunion with an Iowa couple he met back in 1985 when he visited here as a much-lower ranking, provincial official from China. Hu Jintao’s presidency is coming to a close, and Xi is expected to be the replacement. Xi is known for avoiding controversy through his political career, but that made little difference in Muscatine where a warm, though strikingly mixed reception awaited him. Two busloads of students, teachers, and Chinese-Americans pulled into Muscatine a little after 2 in the afternoon. Caucasians were the minority, and the tour’s instructions were delivered in Mandarin. “What was that about?” I asked the girl in the seat across the aisle. The visitors unloaded from the buses under cloudy skies and an atmosphere of confusion. Chinese flags and a banner for the Confucius Institute of Chinese Language Learning came out. Police at the scene kept attendees from lingering in the street, and groups formed at each corner of the intersection to greet Xi. 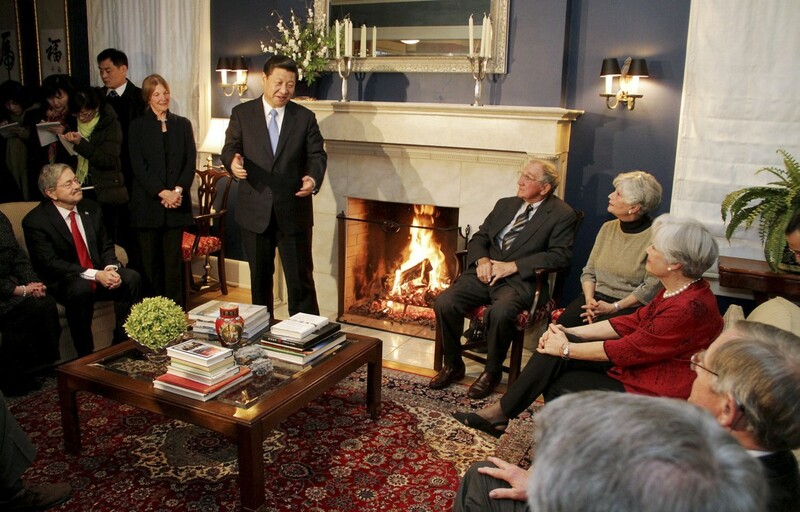 At the other end of the barricaded street, Xi would be reuniting with old friends in one of the suburban homes. With luck, he would be coming down the block to visit with Chinese Iowans. Despite unseasonably warm air, a constant drizzle would make the event absolutely miserable if not for the festival of excitement. The first complication to this came with a group of several older Chinese women who arrived and unfurled not the Chinese flag, or a welcome banner, but a poster showing a sewn-together corpse, accusing the Chinese government of harvesting organs from members of the Falun Gong. Then the Tibetan contingent arrived. The on-site government event coordinator began moving flag-holding Chinese in front of Tibetan flags. Despite initial efforts, the scene evolved into competing demonstrations. Tibetan American Foundation of Minnesota drove from St. Paul to protest Xi’s arrival. Half were in Muscatine and another group would be protesting in Des Moines. “What’s that say?” I asked University of Iowa graduate student and IowaWatch staff reporter Guannan Huang, pointing to the white banner with black painted characters. “We oppose the Chinese government policy in Tibet,” she translated. The Tibetans began to sing their national anthem (or regional folk anthem, depending on whose side you take). The Chinese anthem started up immediately. I asked a group of Tibetan protesters. The older-middle aged man told me that Chinese takeover in 1959 is governmental change and that it has nothing to do with the national borders—as if the outcome of the next U.S. election legitimized the Confederacy. I was then referred to a louder, more English-fluent Tibetan wearing a gray hoodie, the group secretary Sangay Taythi. On the one hand, Chinese argue that Tibet has been a part of China since the Qing Dynasty, but on the counter, Taythi returns to 1959 and Mao Zedong, but more talks about identity. Shortly after, the leader of the pro-Tibet chants started a new line using a racist Chinese impression and the phrase “me so sorry.” This was followed by some comments toward the Chinese that though not in English were assured by one attendee to be “fighting words.” Then it was back to English with “Ladies, ladies, lucky ladies, you survived one-child policy.” The chant leader bounced in rhythm with a sing-song tone. The Tea Party’s appearance gave the atmosphere more international flavor. Three new arrivals came with a yellow “Don’t Tread On Me” flag and took a place next to the Tibetans. “That is not true,” said Qian Chu a Chinese sophomore at the University of Iowa. She explained that neither the Chinese government nor the U.S. government provide any financial support for her education in Iowa which costs significantly more than that of an American student (even out-of-state). “Don’t come here and expect to get stuff from us when you hate what we stand for; who does that? That’s a leach,” said Kelly. Despite being squeezed between Chinese patriotism, Falun Gong supporters and the police barrier, Debbie and Don Reinier arrived with no alliances. “We’re not involved in any of this. We’re just Muscatine residents who came out to see what’s going on. “ They brought their son out to get a glimpse of world affairs as a world leader visits their hometown. “I did not expect this,” Debbie Reinier explained. Police cars lit up the end of block at the hill. Attendees huddled on the Reisers’s front porch, soaked with numb toes. Waiting for the event to end, so to be sure that Xi would not come down this corner of the street that no right-thinking politician would want to take part in. Once that was certain, then the protesters would leave, and then Kristy Reisier could go back inside and not worry about property damage. And with a brief flash of a few headlights, the future president of China disappeared in Muscatine’s misty rain. One student with the University of Iowa Confucius Institute Introductory Chinese class walked the long way around and saw Xi in the distance. Xi was “dashing” in a black coat and red scarf. He is less “lumpy” than he has been said to be, with a build like Dmitri Medvyedev. Criminalizing HIV Transmission - Wise Law or Hysteria's Consequence?